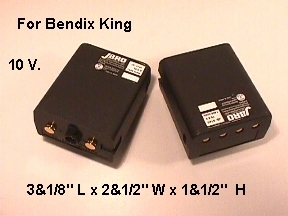 For Bendix King 2 way radio battery, LLA125 , LAA105. LPH & LPX..
Ni-Mh Memory free battery, 10 V , 2000 mah. Dimensions at 3&1/8" L x 2&1/2" W x 1&1/2" H. The battery is brought to you by Battery Barn. Your original charger will charge this battery.